A Nashville man has resigned from his job after confessing that he posted false information about journalist John Seigenthaler on Wikipedia. Brian Chase wrote that Mr Seigenthaler had been implicated in the assassination of President Kennedy, but admitted that he was playing a joke on a colleague. Mr Seigenthaler wrote a damning editorial for USA Today where he criticised the vulnerability of the online encyclopedia as a 'flawed and irresponsible' research tool. Mr Chase told the Tennessean newspaper that he did not realise the site was taken seriously. He resigned from his job at the Rush Delivery firm where he posted the anonymous entry. He has also apologised to Mr Seigenthaler who has in turn stated that he will not be taking legal action. 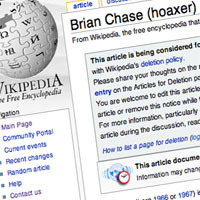 According to Wikipedia Watch, privacy rights activist Daniel Brandt identified Rush Delivery through the IP address used to post the false information on Wikipedia which may have led to Mr Chase's confession. Mr Chase told the Tennessean that he decided to own up when he read that Mr Seigenthaler wanted to find out who had posted the information. Wikipedia responded to Mr Seigenthaler's criticism by amending its registration process so that anonymous users cannot post new stories. It also put a temporary ban on edits to the revised, correct entry on Mr Seigenthaler.